You may have never watched Soviet television in the 1980s, but if you’re curious and would like to get a flavor, tune in to the newly launched Public TV channel. Across the political spectrum, commentators agree that many of the Russian government’s initiatives over the past 18 months are the result, directly or indirectly, of mass anti-government protests that began in December 2011. While protesters demanded more liberalism and government accountability, what’s happening now is more akin to a crackdown on opposition activity, while the government’s reforms are aligning the country more closely with the Soviet past. Public TV is one fresh example of this trend. The idea of a public TV channel was mooted by then - President Dmitry Medvedev in December 2011, less than two weeks after Moscow saw its biggest anti-government rally since the demise of the Soviet Union. The protesters demanded the abolition of what they called de facto censorship on national TV channels, among other things. 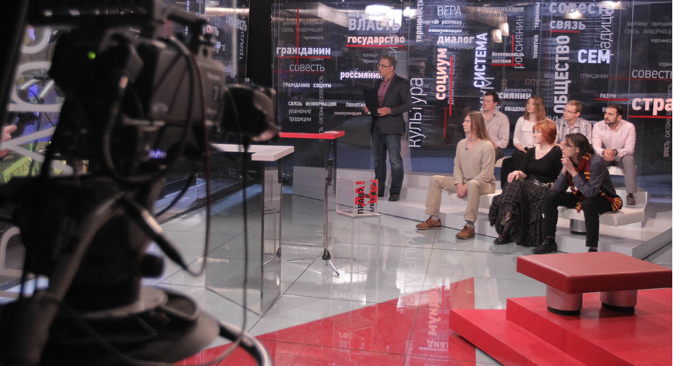 Who's running Russia's newest TV channel? Eighteen months later, the Public TV that emerged from its chrysalis on Sunday, May 19, is a new national channel, 99 percent funded from the federal state budget. It is headed by Anatoly Lysenko, 76, a renowned Perestroika-era TV journalist appointed to his post by President Vladimir Putin. This is taking place in a country where television is critically important for shaping public opinion – it is the primary source of news for some 80 percent of the population, according to pollsters. “Do you remember how to tie a pioneer’s tie?” asks a host in a preview to “Yesterday’s Pioneers: From Dawn Till Dusk,” a 9 pm show about the Soviet-Young Pioneers communist youth organization. Well, no, I never bothered to learn how to tie a pioneer’s tie. Communism ceased to exist in this country before I was old enough to join the millions of Soviet pioneers, and I never joined the post-Soviet pioneers’ movement reincarnated by the Communist Party of the Russian Federation. These were your options: to work, to labor, to create, to sacrifice, to fight and to love. There was no “I have no idea” option, and I felt somewhat discriminated against, while being among the 48 million people that finance Public TV through their taxes. “It was just a joke,” Public TV chairman Anatoly Lysenko said in an interview with the Kommersant daily, answering why the only political talk show on his channel on Sunday was about an archaic Soviet movement. “It’s just a nice day, and we wanted to make a joke,” he said, adding that the program is about managing children’s free time. He promised more hot topics in other talk shows. However, the guests in the studio seemed deadly serious about the topic. Celebrities and civic activists were reminiscing about going to summer camps, taking care of the elderly and collecting empty cans for recycling. No one except the host questioned the need for youth organizations as such. The show was followed by a 1964 Soviet film comedy about Young Pioneers’ camps, called “Welcome, or No Trespassing,” which made fun of the camps’ often excessively restrictive rules for children. Public TV’s main objectives, according to its management, are developing civil society, promoting universal moral values, and enlightening and educating its audience. In addition to the history of the pioneer movement, Public TV is offering talk shows about farmers, autistic children, and a great deal of stories from across the country, with topics ranging from a beauty pageant among dolphin trainers in Sochi to a prison break in Siberia. Judging by the feedback on its website, the channel is quite in tune with its audience. “I’d like to see more educational programs, programs about our country, its people and their traditions,” Yekaterina Osmanova, from Tula, wrote in a comment. Nikolai Kuznetsov, from the Sverdlovsk region in the Urals, asked for more programs about peasants. “There’s no rural life on other channels, only Moscow glamour,” he wrote. A lot of people who left feedback on the Public TV website said they’d like to see “The X-Files” and several hit shows aired on Channel One in the 1990s. “Public television should become a platform for open discussions on the most pressing issues facing the country and serve as a feedback mechanism between the government and the public,” Medvedev said at a Cabinet meeting last May. But some critics have questioned how open discussions will likely be on a state-owned TV channel. Veteran broadcaster Vladimir Pozner pointed out in a recent interview with Dmitry Medvedev that there is “a direct dependence on the authorities” when the channel’s general director is appointed by the president. “Inasmuch as one can be appointed, one can be dismissed,” Pozner said. But Medvedev’s interpretation seemed to be at variance, at least technically, with the fact that the UK’s BBC Director-General, for instance, is appointed by the BBC Trust, which does not include the British prime minister as a member. “There is an imitation of parliament and a simulacrum of political life in Russia, and in conditions like these there was little hope that an interesting public channel would emerge,” said Pavel Sheremet, an award-winning journalist. Irek Murtazin, an author with the liberal Novaya Gazeta newspaper, described Public TV’s style as naïve and provincial. “We made similar programs at TV7 in Vologda in the early 90s,” he wrote on his LiveJournal page. In an interview with BFM radio, the rector of the Media Academy, Andrei Novikov-Lanskoy, said that Public TV resembled Soviet television and was targeted at a senior audience. “The design, style and music resonate painfully with images and impressions from my childhood,” he said. Some 26 percent of Russians agree with taxpayers funding Public TV and 59 percent are not, according to a recent survey by the Public Opinion Foundation. The channel’s annual budget is $50 million, allocated from state coffers. Private donations are meager compared to state funding and are coming mainly from the channel’s staff and the staff of the Communications Ministry, according to Lysenko, the channel’s head.